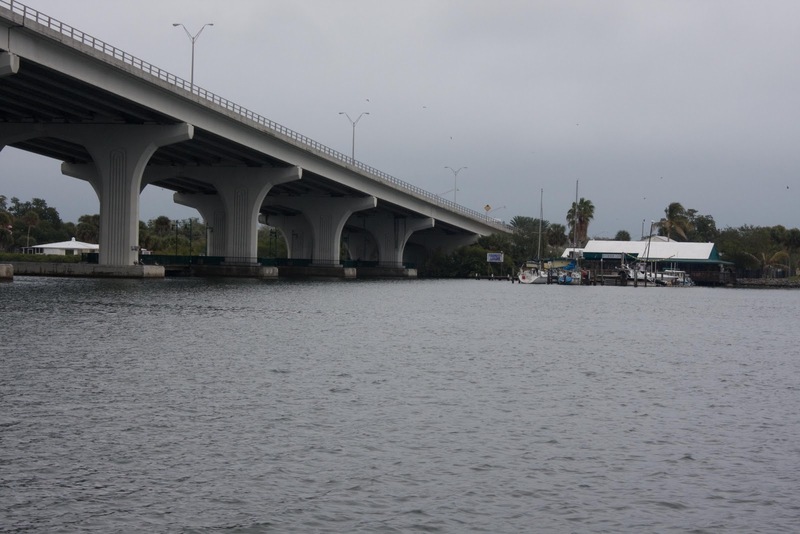 Bridge south of Vero Beach mooring field. We broke the spell of Vero and headed for Stuart today, a short hop on the way to Lake Worth in Palm Beach, which is where we're headed tomorrow. This leg was so uneventful, I'll take advantage of this opportunity to mention what we've been doing. Number one: FREEZING. For several nights in a row the temps dropped down into the 20s. I don't know if you ever lived on a boat in the freezing cold, but it's, um, less than comfortable. We bought a small propane heater that runs off of those little camping canisters, and I loved that until I tripped on it and burned my leg. :-| Despite that, it really helps take the edge off the cold. I didn't know that the cold weather would turn the inside of the boat into a rain forest. We could watch the drops forming above our heads in the v-berth, and more than once we've had our own version of water torture as the drops fell on us in the night. According to wikipedia, "the condensing molecules suffer from reduced degrees of freedom and ranges of motion, their prior kinetic energy must be transferred to an absorbing colder entity." The cold certainly reduced our degrees of freedom and ranges of motion! We transferred our energies to Publix and the mall. It's impossible to sit on the boat in the cold all day, so we rode the free bus to town and hung out like hapless teenagers, complete with backpacks. Number two: Chores. All things pass, and we had a few warmer days to get chores done. Tuning the rig had been on our TO DO list since we left home, and this week we finally got to it. The vertical cables that hold the mast in place have to be tensioned appropriately to hold the mast straight and in place. The tensioner tells you how you're doing. We're spending the night at a mooring in Stuart, poised to head out tomorrow to Lake Worth. As soon as the weather cooperates, we hope to make an outside passage -- in the ocean, finally -- to Miami. Stay tuned. Does the mast look straight? Ironic, don't you think, as I look behind the glasses of "reward," that you own a vessel of sea salt.